NUGGETS! 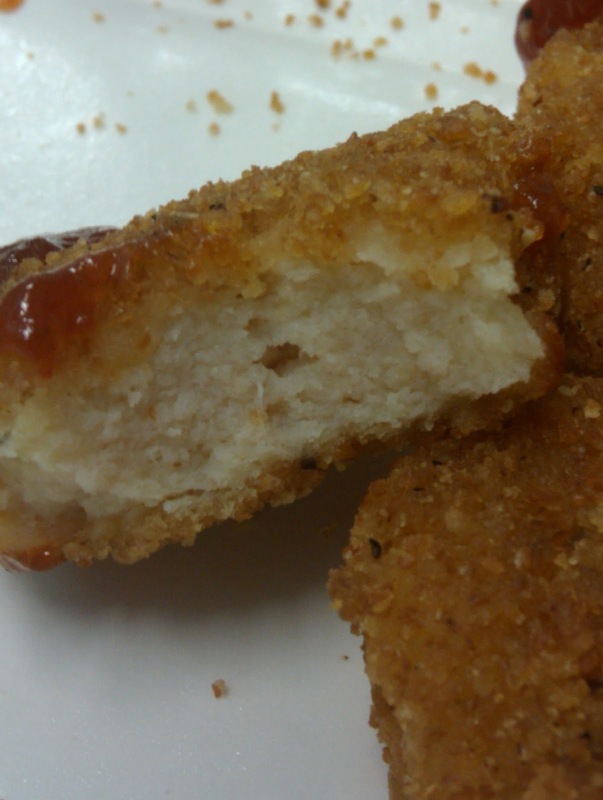 Get your nuggets while you can! Going fast! I chowed down. I was so hungry, I barely even remember entering the cafeteria and buying my lunch. All I could see was FOOD and I was ready to eat it. Since I plan to never again eat another chicken nugget after December 17th, might as well go whole hog, right? I’ve eaten more than my fair share this year, don’t you think? The BBQ sauce certainly helped get them down. This time a peppercorn hit me in the throat, where it decided to stay. It left me sputtering and looking for my water. School lunches usually lack a sensory experience (as compared to when I ate real Mexican tacos in June), but with yesterday’s burp and today’s peppercorn, well, I guess I need to re-evaluate that statement. I couldn’t get through the collard greens. They are so bitter…although not as strikingly bitter as when I first had them. I’m trying to figure out if the greens have changed or if my taste buds have acclimatized. Bring back the spinach! I saved one of these containers and it’s in my cupboard at home! Last night I “bragged” about my son, saying “he’s a great sleeper.” I must have pissed off the parenting gods who then evoked Murphy’s Law. My little boy was up in the night for about a half-hour from 12:30 until 1 am. I was in such a deep sleep that when he first started crying out I didn’t know what day it was. In the middle of the night my mind was racing, “Is it Saturday?” Strange. I have found that when I parent I end up evoking Murphy’s Law frequently. Let that be a warning to other parents (and especially parents-to-be) — you will be smited! I should have known better. Poor kid woke up with a runny nose so there’s our reason. It’s his second cold this fall. He hasn’t gotten an ear infection this fall but he goes to daycare full-time so colds are unavoidable. No diet can stop daycare germs! UPDATED: If you have concerns about your health or your child’s health, see a doctor and as many specialists as you see fit. Also ear tubes are fantastic. Our son was so sick (the average kid had one ear infection per year — my kid had eight by 16 months) and I’m very happy we had the procedure done. It definitely was the right choice for our family. If I had another child and an ENT said tubes were appropriate, I wouldn’t hesitate. Previous PostCall your reps today!Next PostDay 152: pizza and an A+ for effort! Woohoo…you are in the school lunch ho e stretch now! Wouldn't it be weird if one day you started to crave a school lunch? I doubt that will happen once you start eating real food for lunch again. After December 17th, will you continue to blog? If so, what will you cover? Just curious since I am very hooked to your daily lunch adventures/misadventures. Murphy's Law hit our house pretty hard too!!! hehehe I call that "jinxing it"
It sounds like your son is still very young – so having colds is just the best way for his immune system to grow. Sheltering him from everything will only weaken it. I also had very frequent ear infections when I was a kid. It was so bad that my parents started just keeping a bottle of antibiotic medicine in the fridge, we needed it so often. I had ear tubes 3 times, and also my adenoids removed. I can tell you it gets better, as an adult I don't have infections and my hearing is fine, though doctors tell me the insides of my ears are pretty scarred. FYI: Diet can prevent colds. I have followed the Eat to Live Diet for quite a while and- no colds, UTIs (which I used to get constantly), minimal flu symptoms in all that time (a little dizziness while my husband is vomiting for two days (he doesn't follow the same diet)). Sickness in my kids have lessened dramatically (my kids haven't had a cold in a couple of years now and minimal flu symptoms– it is soo nice not having to clean up vomit in beds), though they haven't followed the diet as strictly as I have. My daughter was breastfed for the first 14 months but a week after I started giving her cows milk she got her first ear infection, after her second I took the advice of my chiropractor and took her off dairy, we haven't seen another one yet! Chiropractors are great for some balance between medicine and holistic health. On the note of what the kids will eat . . . I have been subbing in special ed and I often eat lunch with the kids in the cafeteria. It's high school, so there are many options and I find something that works for me. Here's the thing, the first day I asked several students where their fruit and/or vegetable was. The response was, I didn't get any, but the next day, as I sat down, these same kids had fruit and vegetables and ate them! It was my aha moment. Perhaps, if teachers were given the opportunity to eat with their students (and given that time off at a different point in the day to compensate) the students would choose healthier options. If this was a general practice in elementary schools, children would have a great foundation. Please don't get me wrong, I understand how important that half hour is to a teacher, either for some piece and quiet or to accomplish tasks that cannot be completed with students in the room. What I would ask is that teachers still have that time, but at a different point in the day. Even if a teacher choose to bring his/her lunch, they could eat it with the students. meals are a great learning opportunity! Just a thought. You are quitting after Dec. 17?? OMG! I once told a man that I would not be interested in him "even if you were the last man on earth." I eat humble pie everyday because I eventually changed my mind and married him! 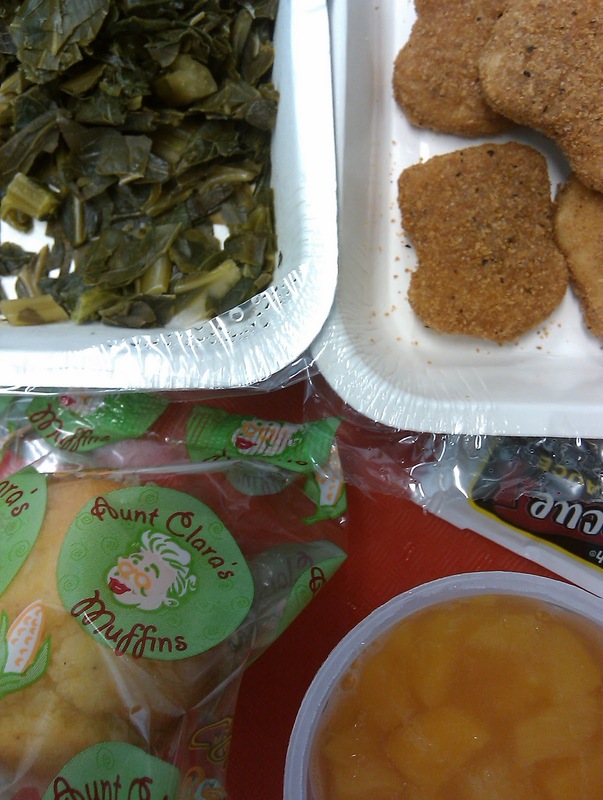 Never say never… you MIGHT actually eat another school hot lunch after December 17th! One can never say for sure!!! I had tubes put in my ears at age 5. I had an ear infection once a week before (according to my mother, I don't remember them.) After the tubes I've had 1 ear infection since….and it's been 20 years now. I teach middle school, and used to teach upper elementary. Most of the kids want some time away from their regular teachers at lunch too. At this age, they need to have a time of day when adults aren't monitoring their every word. Had to chuckle. . .you knew those chicken nuggets were bound to arrive before 12/17! I'm from the South & love collards but the only way to get the bitter out of them is to add sugar (or some kind of sweetener). You don't need much, but it's the only way to get it out. Then they are delish! 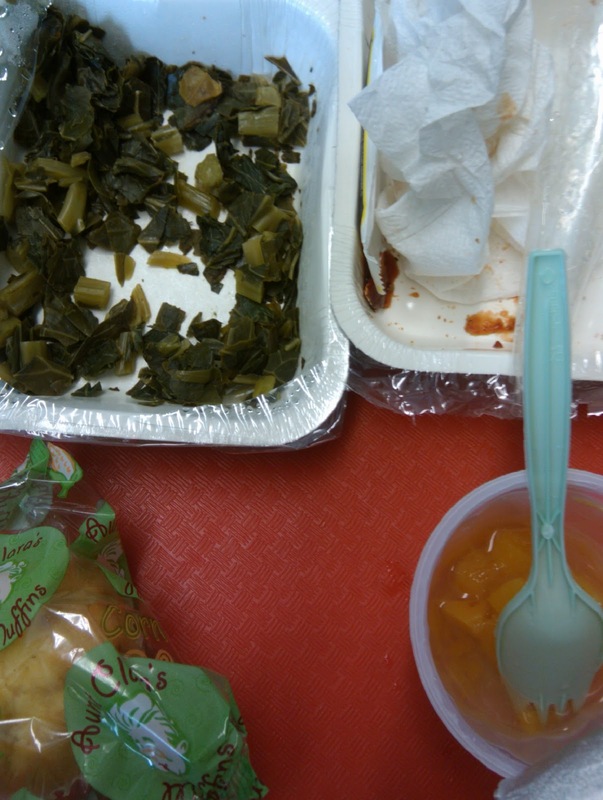 Particularly w/ "pot likker" (the juice) and the cornbread crumbled up underneath. Now that's some good eatin' (as we'd say down South). 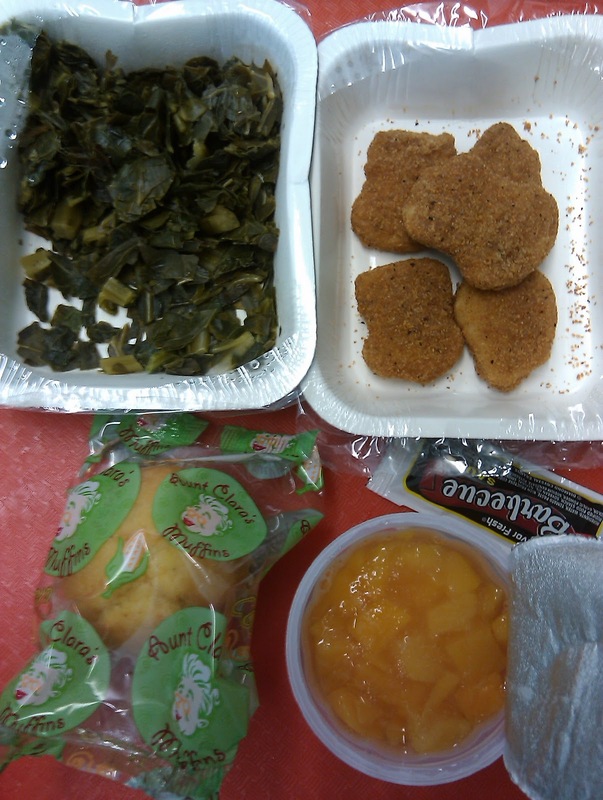 Of course, leave it to the school to mess up collards!! The one that should have sugar & they probably left it out. In Atlanta there used to be the best restaurant called "Agnes & Muriel's" they served a wonderful dish called Lemon-Sesame Collards. It was a simple dish of braised collards w/ lemon juice & sesame seeds. I think that was about all. It's pure awesomeness! 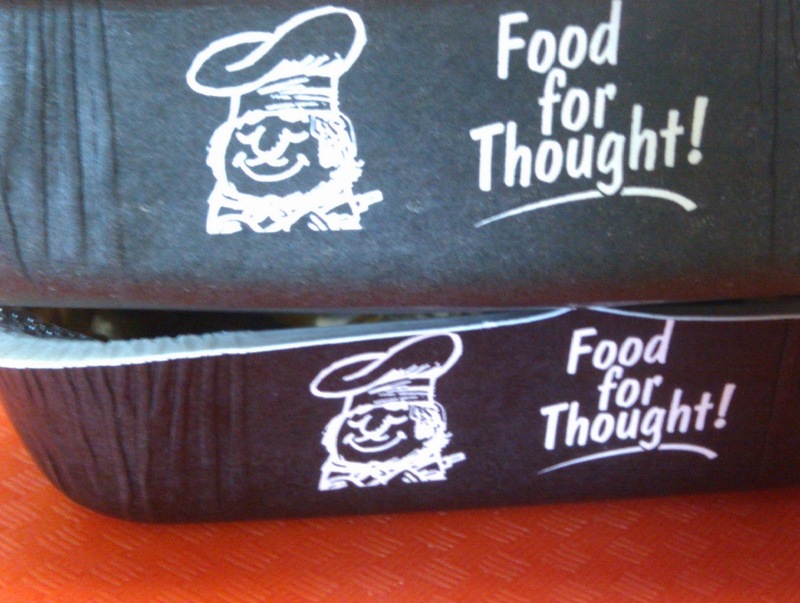 Thankfully, I bought their cookbook before they went out of business. I'd be happy to share this recipe w/ you if you'd like. Feel free to tweet or email me & I'll send it on. There are other marvelous recipes in there too. Might be something to make when you stop having to eat school food! My faves are their turkey meatloaf and mashed potatoes (I now cut the carbs by making mashed faux-tatoes [1/2 potatoes/1/2 turnip roots] by their reg mashed potato recipe). Two weeks to go. You can do it! Both of my girls have had tubes, and one had her adenoids and tonsils removed as well. That one hasn't been sick since (about 4.5 years) – my husband and I joke that the CDC should study her immune system! And the younger one stopped getting ear infections. I hated seing them wheeled down the hall for surgery at such young ages, but tubes were definitely the right call for us. As for the nuggets, I know you won't be sorry to see those go. Was it here on your blog that I saw they are only 50% chicken? Ech. Anyway, you are a strong woman – just two weeks left!! Great job, Mrs. Q! Tip for parents of kids' with chronic ear infections: I was a preemie (3 months) and had ear infections constantly. I was a different kid when I got ear tubes at 2. Ear infections went from all the time to maybe 6 per year. Also: my parents found that avoiding dairy when I had an ear infection helped it go away quicker. Vinegar (apple cider usually for me) offsets the bitterness of collards. My grandma always had a cruet of vinegar on the table to drizzle over the collards when she served them. Your you're finally quitting? Yay! Now will you have the balls to out yourself? At times I have found this blog interesting but it's seems you have become very self serving and smug of late. The "flavor" of this blog has really changed since it began. I've been on both sides if this issue and I think it stinks how you and your cronies, the soccer moms, love to bash people that have little or no say in what gets served for lunch. It's easy for you because you continue to hide behind an anonymous blog. I thought you were going to go public last summer but I guess I was ill informed. Take it from someone who had 4 or 5 sets (I lost count) of tubes put in their ears as a kid, they aren't always the best option (then again, there has probably been improvements in the last 17 years). Every single set ditched my ears within a few months or even weeks…even the "super-permanent-put-a-hole-in-your-eardrum" ones. We ran out of non-drastic options, and eventually my infections and the horrible, horrible PAIN (which happens to be the only thing I really remember of the whole experience) just stopped happening. My hearing improved on it's own, though I do have hearing loss in my right ear; it's only noticeable if I'm head-on with the noise and move my head side to side to compare. I am a master at not getting water in my ears and avoid drastic changes in altitude like the plague!